Manages leave and attendance for the agency, this includes keying, auditing, and correcting timesheets; approving payable time; managing the exception report; and processing all special leave requests. Trains new employees on entering leave and submitting timesheets in Edison. Prepares employee files for separation. Serves as agency Service Award Coordinator and Charitable Campaign Coordinator. Manages the TBI Wellness Program, to include attending State of Tennessee wellness meetings as the TBI representative; conducting TBI wellness committee meetings; and creating, communicating, and tracking wellness events for the agency. 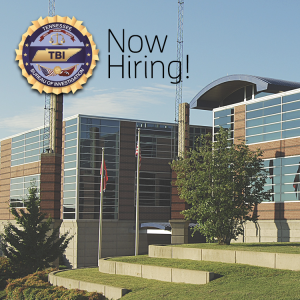 Apply for this position on requisition 163201 on the Tennessee Department of Human Resources website October 11 – October 17, 2017 at http://www.tn.gov/hr/topic/employment-opportunities. Positions will remain posted from October 11 – October 17, 2017, for a total of five business days. Education and Experience: Graduation from an accredited college or university with a bachelor’s degree in chemistry, mathematics, or other natural or physical sciences; medical technology; forensic science, criminalistics, or other forensic related areas; including a minimum of thirty-six quarter hours in chemistry. Applicants must also have completed additional coursework in Molecular Biology, Biochemistry, Genetics, and Statistics, as required by the FBI to perform DNA analysis. Apply for this position on requisition 163285 on the Tennessee Department of Human Resources website October 11- October 17, 2017 at http://www.tn.gov/hr/topic/employment-opportunities. Positions will remain posted from October 11- October 17, 2017, for a total of five business days. Responsible for analyzing physical, biological, or chemical evidence submitted to the Tennessee Bureau of Investigation; and composing technical laboratory reports describing the results of tests. Uses and maintains advanced scientific instrumentation. Consults with criminal court attorneys, and testifies in local, state, and federal courts on the results of forensic analysis. Serves as a consultant to law enforcement investigators across the state. Responsible for crime scene investigation requiring 24/7 on-call status on a rotating basis. Education and Experience: Graduation from an accredited college or university with a bachelor’s degree in chemistry, mathematics, or other natural or physical science; medical technology; forensic science, criminalistics, or other forensic related areas; including a minimum of thirty-six quarter hours in chemistry and two years of full-time professional forensic science work. Two years of forensic science work with the State of Tennessee. Applicants must also have completed additional coursework in Molecular Biology, Biochemistry, Genetics, and Statistics, as required by the FBI to perform DNA analysis. Apply for this position on requisition 163286 on the Tennessee Department of Human Resources website October 11 – October 17, 2017 at http://www.tn.gov/hr/topic/employment-opportunities. Positions will remain posted from October 11 – October 17, 2017 for a total of five business days.